The disappearance of a defense department Cold War cryptologist and his daughter on a Caribbean island alarms government officials in Washington, and Mack Bolan is sent in to find them. But when Bolan comes across a Russian agent and her partner on the same mission, he soon discovers something is rotten in paradise-and it's not just the corrupt police force. A rich American businessman is behind the secret excavation of a sunken Soviet submarine off the island's coast. He's found nuclear weapons on board and intends to use them to dupe the U.S. into attacking Iran-and to strike at America's heart in the process. With international peace and millions of lives at stake, Bolan and his new Russian comrades must race to rescue the hostages and put an end to the billionaire's deadly scheme. 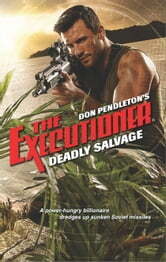 Every man is an island, and the Executioner plans to blow this one off the map.